By noon yesterday, the temperature in my apartment was nearly 100ºF (38ºC) and with the sun bearing down full force on the entire city, and so few trees to provide any shade, it was the first scorching day of summer in Paris. Having lived in temperate San Francisco for much of my life, I was used to days that were always moderate; winter and summer weather could be nearly identical and one never had to do the seasonal ritual of the shifting of clothes when one season ended and another one began. Another thing I got used to in San Francisco was ice-cold horchata, a rice-based Mexican drink always available at many of the taquerias and burrito joints in the Mission that I frequented. But as much as I love horchata, it was odd that I never gave it a whirl at home. So when I got my hands of a copy of Paletas by Fany Gerson, a nifty little guide to making Mexican frozen pops and drinks, I dialed in on the horchata recipe in the book and gave it a spin. I had wondered why the recipe didn’t say to blend the rice with some of the warm water, which I thought would make it easier to break the rice down into small pieces required for the infusion. But a few seconds after I hit the “Blend” button, I realized why not. And although I was a bit skeptical of what I thought was a too-small amount of rice, which might not be enough to give the horchata that special rice flavor, it was spot-on. That first icy sip cooled me right down, and I think that’s going to be the first of many sips this summer. Adapted from Paletas (Ten Speed) by Fany GersonI used rice milk since I like the flavor of it and it is a bit lighter than regular milk, although there are versions of horchata that use plain milk (whole or skim), coconut milk, or even sweetened condensed milk. Feel free to use what you’d like, although if using coconut or condensed milk, sweeten the horchata to taste.Speaking of which, on first taste, I thought this was a little sweet. But after pouring it over ice, I realized the sweetener was just right. The original recipe called for the full cup,bBut you may wish to start off with the smaller amount sugar (or even less) and add more if you wish. Note: Most horchata recipes recommend long grain rice. However, I used short grain rice, and was pleased with the results. In Spain they make horchata with <A href="https://en.wikipedia.org/wiki/Cyperus_esculentus">chufa</a>, which is not easy to find if you live elsewhere. London was a similar temperature to Paris yesterday and this looks like the perfect drink to cool down with. Mexican cuisine is somewhat of an unknown quantity but this makes me what to learn more. Thanks David. This sounds interesting. Do you think using rice flour will work as a shortcut alternative? La horchata originaria de España se hace con Chufa. Es diferente a la de Arroz (y mas antigua). Te invito a que la pruebes, porque es un sabor que no habras probado nunca. Y tambien es una bebida apta para vegetarianos. The native of Spain horchata is made with tigernuts. It differs from Rice (and is an oldest drink). I invite you to taste it because it is a flavor that you have not ever tasted. And also is a drink suitable for vegetarians. In Spain, horchata is made with “chufas” (tigernuts ? 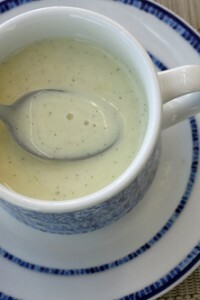 ), it is delicious in summer, you should give it a try. Very typical from the Valencia region. Estiblaliz and Jesús: Yes, I made a note at the end that in Spain, horchata is made from chufa. I’ve seen it sold here in France in Spanish épiceries made with chufe (in cartons) but I’ve not seen chufa (tigernuts) sold anywhere around. There’s so many variations on horchata – from versions made with coconut, various kinds of milk, and almonds, as well. I never had this mexican drink, but I’m more than trill to try this! This looks creamy and rich! oh I love horchata! I’ve found some in the supermarket (in France) from Valencia, with the brand Chuffy… the ingrendiets say it’s made with “tiger nuts”. Is that a bad translation, or is Valencian horchata different from Mexican? I love horchata!! Thanks for the recipe and stay cool! I saw horchata on the streets of Spain but never had it. I always thought it was made with almonds because I assumed it was the same thing as the French orgeat drink made with sirop d’orgeat which has a strong almond taste. It’s so rich and delicious! Horchata is a big favorite during the summer months in our house. I have seen the exact same as Barbara, sold consistently in Auchan. I tried it once to introduce my French husband to horchata, but I did not love it. This recipe will produce something much better I’m sure! Thanks! I so envy your pastry chef skills. How lucky (and fun) for you to just whip up a little something like that lovely horchata when the occasion calls for it. Bon app! On a recent trip to mexico, I could often be seen downing liters of horchata… I tried getting over my horchata addiction back in France but I still miss it, and Klass just doesn’t cut it. Looking forward to trying this recipe! I’ve started to see recently some chufa powder(?) in an organic supermaket in Germany, part of a larger chain. Time to try it I think. Thank you for the inspiration. As if it wasn’t hot enough you had to clean the kitchen. Advice taken on how not to make horchata. I’ve only had it once and never thought about making it at home. I’ll save this for when summer finally comes down under and give it a go. I don’t know much about the differences between kinds of rice, so I apologize in advance. I have some basamati rice in the pantry. Would this work? 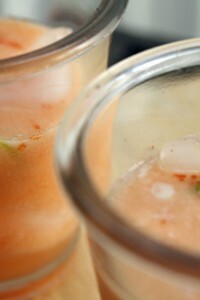 Oh I love Horchata, I posted this drink on my blog for my Mexican food adventure. It really is incredibly refreshing. Thanks for sharing the recipe. I love Horchata! I wrote about this drink on my blog, for my Mexican food adventure. It really is refreshing. I’ve had it frozen as well, that is the perfect thing to have on a hot summer day! Thanks for the recipe. -She would first “roast” the rice directly in a pan, slightly, just to the point where it would start getting brown, but it should not get brown if that makes sense. -The next step is to take the rice, sugar, cinammon branch and water and put it all together in a blender. 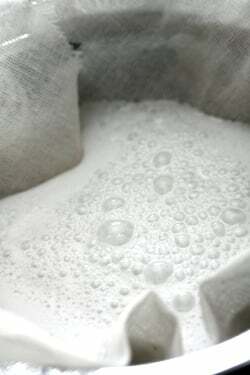 -After which you would pass the mixture through a sieve or cloth. -Put in the fridge, add ice, and enjoy. So as you see, not everyone uses milk, some people do, as a complement but not traditionally. The Spanish recipe with tiger nut is also without milk. Horchata (as we studied in our Food technology class) is made by pressing the goodness out of a cereal or nut (like coconut or almond as you mention), together with sugar and cinammon. As you mention, horchata in Spain is made with chufas, which are tiger nuts. Chufas are small tubers of a cultivated sedge (Cyperus esculentus. They are about the size of almonds, have a crisp texture and a taste reminiscent of coconut. As horchata is a direct descendant of Moorish “orgeat” made with ground almonds, I suggest using almonds in my recipe in MY KITCHEN IN SPAIN. In Valencia, Spain, horchata is sold at horchaterías, and is usually soft-frozen, quite delightful on a hot summer’s afternoon. I’m a huge lurker reader of your blog, and I just wanted to say that I love reading about all your American-in-Paris stories and recipes, David! Also a quick question: when leaving this rice/water/cinnamon stick mixture to stand overnight, is it done in the refrigerator or out? Oh thank Heaven! We have been purchasing Horchata pre-packaged here from our local grocery store for the last few months but just recently they started to use sucralose instead of sugar. We could tell the difference in the taste immediately. I was thinking of making Horchata frozen pops, thoughts?? I’m trying to decide which color cashmere to wear here in Oslo – perhaps one summer you will to do a series on Scandinavian food and find yourself here in the cool north! The horchata sounds wonderful – I will give it a try. I’m not so adept at cooking food but making food is another matter – any recipe that calls for a high speed appliance in the first sentence works for me. Really I am only commenting as from time to time I feel the need just to send an appreciation – I have nothing to add to the discussion – just want to say thanks! So many of my successes in the kitchen are thanks to you! Leah: Yes, give it a try. I’m sure they’ll be delicious – although I don’t know what sucralose is since we don’t get those kinds of things much here in France..
Rachel: I linked at the end of the post to an article talking about the different kinds of rice used in horchata. You might want to check that out for advice. Amanda: Interesting about toasting the rice. I don’t know if I’d like a toasty flavor in it, but there’s so many different kinds of horchata. About the milk issue, I do like rice milk and thought it was a great addition, but certainly one with all water might be just as refreshing, or more so. Germany here and we are having the same – I have been making Horchata as well – only I am using rice and almonds – I let it soak with Cinnamon, a little nutmeg and a few strips of lime zest I have peeled off – all else the same – the lime gives it a great zing – my favorite hot weather drink – make a batch a day lately. Mexican horchata is a pale imitation of the real thing, Spanish horchata, which is made from tiger nut milk. Far more tasty than rice or pepitas! Love this recipe, David. Need to try it with all the different milk versions to cool off here. Just outside Paris yesterday, we couldn’t get out of the gate since the metal had expanded. If I ever get stuck in the house again due to silly temperatures, at least I can make your Horchata since all the ingredients are the kind you have in the house anyway. Brilliant! We just got back from Spain last week and Horchata is indeed delicious. One can buy it in the supermarket, but the Horchata available in the bars, to my palate, tastes much nicer. I will give the recipe a go and see how it compares. It was in the 90s F walking down rue du Faubourg St-Denis yesterday and I saw a bunch of people crowding around a Turkish takeout waiting to buy a glass of cold white drink! Managed to squeeze through and saw the word “aryan” painted on the makeshift stand. Looks churned up and foamy. Is this something those the Middle Easterners drink on a hot day? After the birth of each of my children, my mom always made sesame seed horchata to help in “milk production”! Ja! Soo good… Will try this version soon. David, where can I find cheese cloth in France? Would love to make horchata and cottage cheese I found on your website!!! Thanks again for your wonderful recipes!!! We have all but given up on ordering horchata in Mexico — the sweetness level is over the top, but in keeping with Mexico’s love affair with sugar. In stores here, one can buy instant horchata mixes (complete with excess sugar) made with either rice or barley. Diana Kennedy, in her book Mexican Regional Cooking, has a traditional, and delicious horchata recipe made from cantaloupe seeds. Flavored with lime juice, it is so refreshing on a muggy day. David, here in SLC I can only find very few places that will serve good Horchatas, so you can imagine how I indulge every time we go visit our family in SF. I never thought the recipe would be so simple. Giving a try this holiday !! To ED K: Aryan is a Yogurt drink, which that is pretty much what it is Yogurt and water, and sometimes they will put salt or honey. And be sure to take the elevator, which still has an operator who works it! Sounds like the perfect drink to go with tomorrow night’s churros! Now if I can just find a way to turn a can of evaporated goat’s milk into cajeta, we’ll be set. Darn grocery store doesn’t carry regular goat’s milk, or condensed. David, you NEVER fail to provide me with interesting projects. Your writings are greatly appreciated. My husband LOOOOOVES horchata and his birthday is in 2 weeks. Methinks I know what special drink I am going to serve him! Thanks, David! In the markets in Los Angeles, we have cartons of rice milk, coconut milk, etc. Can’t you just start with the rice milk and flavor it? Instead of having to grind up rice? Would that ruin it? I know the purists will be offended, but the rice milk is quite good. kathy: Rice milk isn’t all that “rice-like” in flavor, so you do need to dial it up. This is so easy to make, do give it a try! Would this be a use for steamed white rice, too? 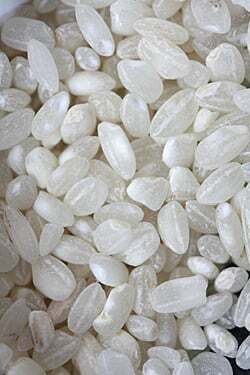 When I heard toasted rice and sesame seeds, I’m wondering if there is something in the dry seed that would be missing. I love anything with sesame, too. Modesto has a new “Mexican” ice cream factory. Oh is it good. They have wonderful combinations of fruits and flavors and corn sugar free in some. My favorite is a creamy bar with fresh crunchy walnuts. Better than maple-nut any day. The local Hispanic community is all very familiar with it; the Anglos, not so, I’ve given up talking about it. More for me :-). Look for Michoacan next time you are in CA. Ah YES YES YES!! I grew up in Sacramento ca and I am from Mexico via a mainly Spanish family, so you are speaking my horchata language. I was literally two days ago explaining to my boyfriend how I grew up with men riding their bikes with a paleta bin on the front, I’d mostly buy the lime flavor, it’s the Mexican version of an ice cream truck. Instead of the music, they rang the cutest bike bell, I loved it! So this recipe hits home and it’s my favorite among all of the Mexican waters. So thSnk you for sharing, I’m going to make it today! Every time I read one of your blog posts, I’m ready to rush into the kitchen and get started on whatever you’ve written about. Today is no exception. It’s hot and very humid in DC today but at least we’ve got AC. Can’t you get yourself at least a little window unit? Or is it just not done and you must continue to suffer? Oh, great summer post! Thank you! I believe the origins of horchata are in Valencia, Spain. There’s a place across the street from where I work that sells horchata in the summer. They make it a bit too sweet, but I’ve figured out a genius fix. I buy a large one and then I head over to the coffee shop next door and order a shot of espresso, which I dump into the horchata. The combination is amazing and the coffee tames down the sweetness of the horchata. I’m slowly adjusting to that SF weather you mentioned; having lived in North Carolina and Chicago my whole life it is definitely different – BUT – awesome. i made horchata once for a cilantro-themed party and have always wanted to make a regular batch without the horchata. this looks great. I had this for the first time in Seattle and loved it ever since. For my children, Spring begins when our neighborhood “horchateria” open its doors. They love horchata very much and they could have horchata breakfast if their mother was less strict… Here, in Barcelona where we live, our horchata is made the valencian way, with chufas. If you come to Spain, try Horchata with Fartons. A farton is a ladyfinger type of cookie that’s dunken in horchata. Not my thing, but tastes good. I’ve never had horchata, but it looks very refreshing! It would be nice in this muggy weather we’re having near the Jersey Shore. I haven’t had horchata since I spent a few months Mexico years ago. It’s delicious, and yours looks great! 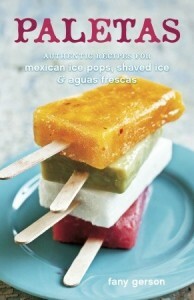 Paletas is on my cookbook list and I can’t wait to try horchatas! What I love about the world of food is that there’s always something new to discover. Thanks for sharing. The horchata from Valencia es made out of tiger nuts which has a completely different flavor. Unfortunately the one pre-packaged has very little to do with the natural one. In my opinion, the best of the best is “horchata cream” (crema de horchata), a short of ice creamed horchata that is prepared only in a couple of places in Valencia, one of them “Horchateria El Sigo”, in the old part of the city. If you happen to go there, don’t miss it. so, i guess i shouldn’t complain that it’s raining today in the bay area? :) oh well, if it ever warms up, this is on my list of recipes to try! Although I haven’t been to Mexico in the middle of summer I fell in love with chilled horchata instantly. Thanks for the recipe and the tips! Love Horchata. Dave, I live in San Francisco. It is raining and the temp is around 65 degrees F today. I have a half-gallon of the pre-made stuff I pick-up in a carton at Luckys in my fridge. In the Mexican food section you can buy small envelopes of add your own milk, stick in fridge and you have pretty good not great Horchata. I used to make it myself (similar recipe as yours) and would add canned evaporated milk (diluted with water) because someone in a Mexican restaurant said that was his recipe. When is your next trip to SF? Why not come now? It’s cool. In fact the last few mornings when I walked the dog at 6:00 am it was 51 degrees F. Yipes. When I lived in Paris, I used to take a wet washcloth and put it in the freezer for about an hour. Then I’d take it out and lay it on my forehead. Crazy but it helped on those really scorcher days! Hey there! I’m allergic to cinnamon (and allspice). Is there a way that I can make this without losing the flavor? I was wondering if maybe a small piece of ginger, a nutmeg and a few peppercorns soaked. Any other ideas to enjoy this? Thanks! oo this stuff is so so good. i once had horchata described to me as ‘like if a cinnamon roll was a drink’. mmm. Rice is already soaking! Can’t wait to drink this tomorrow. I added in some lime zest and fresh ground nutmeg, too. Thanks so much for the inspiration. My kids LOVE horchata! They order it whenever we hit the local taqueria…now we can make it at home! The horchata looks so good. Any idea for those of us (or maybe just me?) without blenders? Can you use rice flour? Or is whacking and pounding the rice with a rolling pin the ony answer? Skippy: You could use a mortar and pestle, or just try using whole rice. The original recipe said that was okay, but I haven’t tried it. Norine: I would imagine if you blended cooked rice with water and/or another liquid, you would just get a thick sludge rather than a beverage that’s drinkable. Ann: Sure, any spices that you like would be an interesting addition. Thanks David! I love that you always have the recipe I’m looking for! I am excited to try this one out. I rarely find acceptable horchata locally. the temperature in milan is like in your appartment! I’m often frustrated by our cool SF summers since I never get a chance to make my “secret” family ice tea recipe, but we’re expecting temps in the high 70s in SF this weekend (Yay! ), so I’ll definitely try this out. Thanks for another great post. Oh David, David, David! You beat me (a Latina) to this recipe post. We are posting our family recipe this week. It’s very similar to yours/Fany’s recipe although we do not use any milk, which is great for anyone who might be lactose intolerant. PLUS it keeps longer in the fridge. We also add a clove and a dash of vanilla. All horchata is muy bueno with this crazy HOT weather! Love your photos and funny story about the rice incident. LOL! Hope to meet you someday – I’m a HUGE fan of your blog! Interesting. Almost sounds like a liquid/drinkable rice pudding. I have never heard of it before but it certainly appears to be a lovely summer drink. Chufas or tiger nuts are usually available in the local Spanish Ferias(fairs) along with fresh coconut..they are displayed under a curious little watering can type apparatus. Oy, I love horchata too, having ‘discovered’ it on a sweltering day in Barcelona…And now that we’re broiling in the south of France, now might be just the right time for trying this Mexican version. Thank you for sharing! I’ve always wanted to make this, so thanks for the recipe. 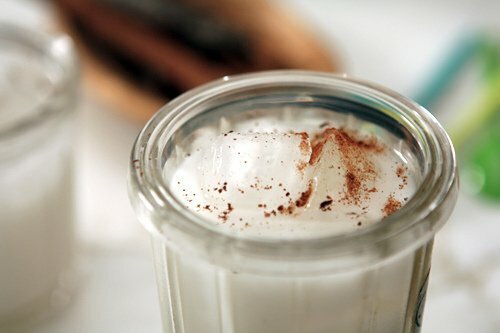 Yvette: There’s so many kinds and variations of horchata and yes, many can be made (or adapted) to suit various diets. I happened to have rice milk on hand and it was perfect. Agné: I’m not a big fan of overly sweet things (some Mexican things can be quite sweet) and I didn’t find this too sweet, but glad you found a solution. Next time just add less sugar, to taste. I didn’t know this drink, it must be really be refreshing and it may be possible to turn it into an ice-cream… Looking forward to trying it, thank you for sharing! I love everything about this recipe especially the photos. Bravo! Then when I went to Mexico City the first summer I was in grad school to study Spanish, I had several versions of horchata there. But nothing matched the one at that place across from UNM where I first tried it. In fact, that’s one of my favorite food memories ever. I don’t think I could make something that tasted as good as that one did, but hey, I guess I could try! Having a similar sweltering place of residence I am loving the last couple of posts you have done with cool, refreshing drinks. Thank you for sharing! I lived in San Francisco for ten years and have been around Atlanta for decades but have never heard of Horchata. There are beaucoup Mexican restaurants around here – I’ll see if they serve it as it sounds very good. By the way I ordered your book and received it this morning – je vais le commercer bientôt! All you timid souls: This is ASTONISHINGLY EASY: about 5 minutes at the beginning of the process, and five minutes at the end. Be wary of the sugar, though. I cut it in half for my test run, and still found it too sweet, and I am a real sucker for sweet. Start modestly: it is far easier to add sugar to a recipe than it is to remove it. I am also looking forward to trying this with the linked recipe with almonds. Question to David: would this work with a rice flour? Hi David, one quick (hopefully not that ignorant) question – from the photos, it looks like you are starting with uncooked rice. Is that true, or should we use cooked rice? Kelly: Yes, the rice is raw. Steve: Yes, it is easy! But to you (and the others) asking about using rice flour, it would turn into a big pile of mush that you couldn’t strain, plus I don’t think rice flour has much of a rice-y taste (although I’ve not tasted a spoonful..) so I’d stick with regular white, uncooked rice. David, You can get fresh pasteurized at the Biocoop at Montgallet. David, You can get fresh pasteurized goat’s milk at the Biocoop at Montgallet. That is so freshing,I’m gonna need a few of those to get thru this summer. I tired your recipe and it was really delicious. Also, its taste is very similar to a turkish desert named “sütlaç”. When i drink horchata, i thougt that this is liquid version of sütlaç. 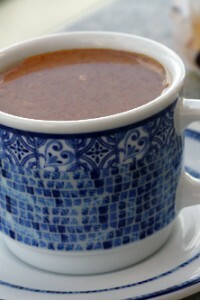 Because sütlaç is also made by rice, milk and sugar. On the other hand, i really curios about the almond version of recipe. I think, i’m gonna try that one, too. Made a batch today with agave and coconut milk, as this is what I had on hand. Having some right now with a shot of dark rum, and it is a fantastic summer cocktail! I had to smile at the mention of summer, especially when we’re experiencing rain and winter here. 38 degrees? That is crazy. If it’s one of those humid ones, then I don’t envy you. The drink looks interesting, I might try making it when summer hits. It looks like rice pudding but in liquid form. David, if you wanna learn what horchata really is, come on down to Spain! Do i need to use boiled water or just a little warm? now that you’ve gotten our appetites dripping for horchata, you’ll need to develop a recipe for horchata ice cream. Folks: A tea towel is a very light towel that would be used to wipe up light spills or line a tray to catch the odd spill when you are carrying drinks. It is usually about as light, or lighter than, a cloth napkin (also a usable option). I’ve always wanted to make horchata! My favorite taqueria has an amazing version, but I don’t have a chance to go there often. I only have brown rice at home. Do you know it that would work? Absolutely love, love, love the blog. Quick question: Does the sugar dissolve well in the room temperature liquid? In reading the recipe, I was wondering this immediately. IMHO, the best horchata comes from Central America, where it is made with ground seeds of the Jícaro (AKA Morro) gourd, which grows on a type of Calabash tree. Jícaro gives Central American horchata a rich, toasted flavor totally absent in the Mexican rice (or rice and almond versions). Central American horchata is flecked with brown specks of ground jícaro and the sludge at the bottom is stirred into the drink — not something you try to totally filter out. Love your recipes David and your blog! Funny, I had never heard of this type of horchata. Spanish horchata is made of “chufas” (tiger nut) and it’s very typical in cities like Valencia. First things first: I love your blog. Can’t get enough of it. i lived in San Diego for 2 years and horchata was an everyday drink for us. Now I live in Birmingham, AL (dont ask me why, i dont know either) and we are melting! I was wondering why did you not use a food processor instead of a blender? I want to thank you so much for the horchata recipe. I made it yesterday and I love it. I always have a glass of milk with ice cubes in it before bedtime and this kicks it up a notch. The addition of the cinnamon stick makes it a perfect drink. To add to Lola’s comment…..I tried a food processor first and the grains of rice just whirled around and did not break down. I put them in a Waring blender and it did the job without a problem. Thanks Dave for once again adding goodness to my life ! I love this blog and have for two years now. When i make Horchata, I use pantyhose to strain it. 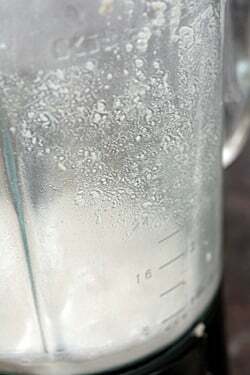 I make a simple syrup, adding the juice of one Key lime and vanilla extract to sweeten it. It makes a great cocktail with Tequila and lime. Yum! Thanks for the recipe. In Valencia, Spain recently I tried Horchata made from Chufa nuts (it tastes similar to almond milk). It’s supposed to give you a kick of energy which I definitely found to be true but am not sure whether it was from the sugar or the actual chufa nuts. I’ve also had the Mexican horchata made from rice in Guanajuato. They had tonnes of different flavours including grass flavoured horchata! I wouldn’t recommend drinking the stuff from street-vendors – I’m pretty sure the horchata I drank off the street made me sick! It was pretty refreshing though! Yikes, grass? But I hear you on the street vendor food in Mexico (and elsewhere.) So much of it is really great, but you do need to watch out. 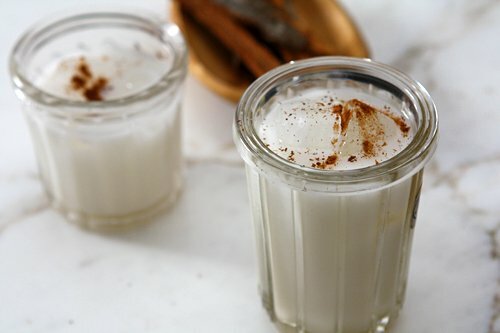 I got really sick once in Mexico and it was an experience I don’t wish to repeat either..
What an AMAZING horchata recipe! I grew up in San Diego and practically lived off this stuff. Now I’m in Israel, where neither of the two Mexican restaurants (if you can even call them that) bother to make horchata. But now I have a simple and lovely recipe for horchata that’s even, dare I say, better than what I loved back home. Thanks for sharing! Thank you, David. Just in time for my next trip to Spain. Now I know what horchata is and will try it. Sounds delicious. I haven’t had horchata in years. I am glad to have a such a delightful reminder while reading your blog. I’m having dinner guests tomorrow and plan to add this to my menu. I’m adopting this recipe as my new favorite. I’ve made horchata before and it was always kind of watery. Here in KC we had a “food truck festival” this past friday, and I was delighted to find the very best horchata I’ve ever had there, courtesy of a little place called Poco’s. So, I searched for a new recipe and was so excited to see you had just posted this, David! So I made it immediately. I didn’t think my blender would grind the rice all by itself without any liquid, but it did, happily. I started steeping at noon and it went for about 20 hours. The resulting frothy stuff smelled a bit of yeast, so I figure I picked up some probiotics too. :-) Probably should steep in fridge? I used 2/3 C sugar and that seemed a little long. But other than that, it was divine. 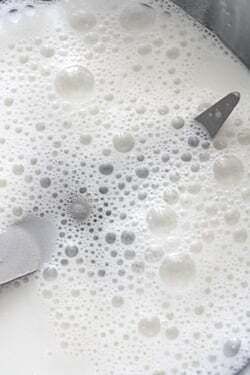 I like the milk addition – some don’t use use milk, but it adds rich texture that I appreciate. So David, as usual, a big hit. Merci beacoup! I’m the manager of a seasonal/local bakery and cafe, and latched onto your horchata as a drink special for the month of July. We are serving it with a shot of espresso–a horchata latte if you will. Thanks for the inspiration. Might one skip the grinding and use rice flour? I get mine in San Francisco’s Japantown for other purposes… and just thought it may be a shortcut? A few others asked this in previous comments and the problem is that when you combine flour and water, you’re likely going to get a clumpy soggy mess that you won’t be able to strain. Plus I don’t know if rice flour has the same taste as rice.